2BR 2BA Ground-floor Beachfront Condo THE LAURELEI with spectacular views. Relax at our beachfront Cayman Island home, The Laurelei. Located in Grand Cayman's beautiful upscale North Side/Rum Point district, with its miles of quiet white sand beaches, cooling breezes, and friendly hospitality. Groceries, seaside restaurants & activities close by. This safe island begs exploring! The1270 sq ft Laurelei has a beach cottage feel, with its own front and beach entrances. Bedrooms sleep 4. A large screened tropical Lanai opens to it's own private deck set directly on the white sand beach. Beachfront freshwater wading and deep pools. 18 feet of sliding glass doors display gorgeous views of the turquoise Caribbean Sea. Newly custom furnished in tropical blues, greens, mangos and yellows. Luxury beds & linens. A fully equipped kitchen, granite counters, white tile floors. Central A/C, ceiling fans, movie channels, DVD. Explore, swim & play in clear, shallow, warm water sheltered by a colorful reef. Snorkeling and Diving are terrific right from shore. Pool lounges, Beach towels, Poolside palapa. AMENITIES: The Laurelei's location is in a quiet, upscale neighborhood of oceanfront homes & natural habitats, away from crowds & cruise ships. The intimate complex of 10 units is directly oceanfront, not on a lagoon or marina. The Laurelei is one of only 4 condos with it's own private deck set directly on the white sand beach. Amenities: Central Air-Conditioning, Ceiling Fans, Ocean breezes, Private Deck with 2 lounges, Spectacular Ocean views, Screened Lanai with Dining area (seats 6). The fully equipped kitchen has Italian granite countertops, Glass Top Stove, Oven, Microwave, Blender, Dishwasher, Toaster, Coffee Maker & Grinder, Smoothie Maker. Full cookware & bakeware, utensils, tools & a multitude of spices. Formal and informal Dining Services, Cookware, Linens. The living area has beautiful views of the Caribbean Sea. A queen Sofa/sleeper, Swivel chair and love seat, LCD TV, DVD, Cable/Movie Channels, Games, Book Library, iPod dock & CD boombox, guestbook, island literature. High chair & portacrib. Linens & Beach towels, Clock radios. Free local phone calls & Wi Fi Internet. Manager close by. Maid service provided before & after stay--no extra charge. Car rental arrangements can be suggested or made for you. Information/tips packet provided to booking guests. Activities: Enjoy the unspoiled uncrowded North Side, where relaxation is easy. Read a great book under a palm tree. Take a morning walk with green Cayman parrots. Snorkel or Dive from our white sand shore in colorful reef-sheltered, shallow waters with 200 foot visibility! Dance to island music under clear star-filled skies. Kayak in bioluminescent waters at night. Enjoy a Cayman Colada at beautiful Rum Point's Wreck Bar. Rent a bike for a ride down quiet safe seaside roads. 3 min. to beautiful Rum Point Beach Club & Red Sail Sports. Try the Stingray City sandbar experience, Dives, Jetski rentals, Sailboats, Kayaks, Volleyball, Hammocks, shady beach, Wreck Bar & Grill, lounge. Bioluminescent kayak & boat tours at Kaibo. THINGS TO DO:: Nearby restaurants & bars offer famous Mudslides, Dancing to Reggae, Soca & Rock, Sports TV. Area: Located just 35 scenic minutes from the Airport and Georgetown, the North Side offers great seaside restaurants with casual to exquisite dining. Get your groceries on the way out at Hurley's or Fosters Food Fair, where you can find everything you need for terrific gourmet and casual dining at home. Small grocery just 5 minutes from condo. Visit the busy capitol of Georgetown for duty-free shopping, sightseeing, and watching the hustle bustle. Travel up 7 Mile Beach with a stop to swim & lunch. Visit Boatswain's Beach Turtle Farm. Mail a card from the post office in 'Hell', Horseback Ride on the beach at West Bay. 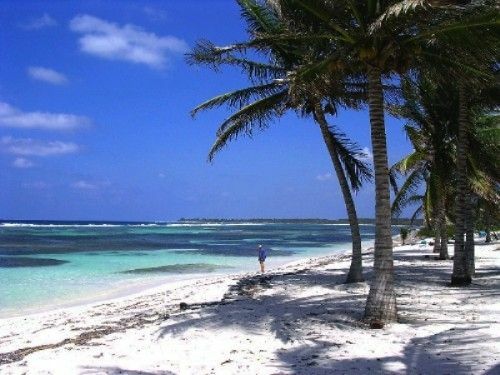 Then-- Return to the relaxing, secluded North Side's open spaces, where you'll have the beach to yourself. Watch a spectacular sunset! As private owners of The Laurelei for 12 years, and visits to Cayman for 23 years, we offer travel advice to our happy guests. We are private owners of The Laurelei, purchased in 2001 from the original owners. We had stayed at North Pointe as guests for a few years and always anticipated each return to the island. The Laurelei is one of only 4 groundfloor condos with a private deck & back door opening directly onto the beach. 18 feet of sliding glass doors open to gorgeous views of the Caribbean Sea. The complex of 10 units was completely rebuilt in 2005-2006, with state-of-the-art poured reinforced concrete construction (one of the strongest systems possible), after Hurricane Ivan caused damage in late 2004. We chose luxury upgrades, added custom furnishings, fine bedding & upholstery & linens, along with artistic touches such as original artworks and island sculpture. We take pride in constantly updating our island home, providing all the amenities and in making it as comfortable and affordable as possible for our happy guests. Things we love about our island home: We love the intimacy of a small island and the friendly and safe atmosphere that Grand Cayman offers. The North Side beaches are empty, secluded, with many open seaside areas & exclusive homes on large lots. Being alone with nature and the Sea and having the beach to ourselves much of the time, is priceless. We also love knowing the weather and the Sea are always warm. The sea & sky are ever-changing with different hues of turquoise and cobalt violets and pink, and one is enveloped in a feeling of peace and relaxation. The North Pointe complex of 10 condos has wonderful management, friendly helpful owners, and is set in a safe, uncrowded, upscale area; the only apartment complex in a 2 mile radius. Our guests can have the choices between peaceful seclusion and easy access to attractions, water sports and dining/nightlife. The Laurelei is fully licensed with the Cayman Islands Department of Tourism and meets its strict standards. Both baths have Italian granite countertops, 18' travertine-look tile, ample plush towels, starter tissue & soaps, shampoo, wall-mounted hair dryers. The Master Bath boasts and oversized tub, travertine-style tile surround, Kohler and Delta fixtures, and ledge with glass block screen. The Guest bath has adjoining large glass door walk-in shower with ledge, travertine-style tile surround. Long secluded white sand beach. Shallow waters within the nearby, colorful reef - just a short paddle out. Views from 18 ft of sliding glass doors have wonderful views of the Caribbean Sea, and open to a large screened lanai where you can watch the sparkling waves & enjoy the sea breezes. Directly on the Caribbean Sea & beach. NOT on a lagoon, marina or inlet. Long white sand beach with sandy entry areas and easy snorkeling from shore. Stunning views of the azure Caribbean Sea from 18 ft of sliding glass doors. Facing the Carribean Sea--just 20 footsteps to the sea! Not on a lagoon, marina or inlet! 400 ct. luxury bed linens provided. Bath & Beach Towels provided. Spacious living area with sofa, love seat, swivel rocker, custom tropical decor. A large entertainment center, holds a flat screen TV, DVD, library, games, island literature, etc. Ice-maker. Cold cubes. Cold packs. Complete set of china and melamine dishes, bowls, etc. Glass top stove & oven, Ice-maker fridge, microwave, cookware, blender, coffee maker, smoothie maker, coffee/spice grinder, spices, food processor. HBO and Movie Channels. HD Flat Screen TV. Eclectic book library in condo for our guests. Kayak rentals at Red Sail Sports. Bioluminescence tours. Lounge chairs & table on The Laurelei's private deck. Wave runner rentals, sunset catamaran tours, glass bottom boat tours, Stingray City & more- just 3 minutes away. We offer a drive up area to the sidewalk where there is one short step into the condo. Fresh water wading waterfall pool and large pool with deep end. Gentle salt conversion system.Only 10 condos share pool. The Laurelei offers a direct oceanfront locale (NOT on an inlet or lagoon! ), where you can take advantage of the colorful reef, the refreshing sea breezes, a secluded long stretch of beach. Enjoy nature's best, with local indigenous green parrots feeding in the nearby trees. Snorkel in the shallow reef-protected waters, where colorful sealife abounds. Dance at local bars to soca and reggae, and star-gaze on the sand with your sweetie. A favorite activity is exploring the long beachfront, where you can stop and swim at any point as it is the 'Queen's beach' - Find a sandy tidal pool and float or swim! Put on your beach shoes and hike through open seaside lots, discovering island flora and fauna. The Laurelei is designed and decorated to provide luxury, comfort, and affordability. High Speed/ DSL Internet is free. Local phone calls are free. Smoking permitted outside only. As owners for 12 years and island regulars for 22, we offer guests a great info & tips package. If you are looking for relaxation and wonderful accommodations, look no further. The Laurelei is beautiful and has wonderful amenities and a gorgeous location. This serene condo is clean and stocked with everything you need to have a great vacation!! My family of four enjoyed the quietness of the condo and the neighborhood. It was away from the hustle and bustle from 7 mile beach and that is just what we were looking for. I have stayed in many rentals and this condo is an A+++++ I hope to visit again soon!! Had a great experience. The Condo itself was very well done and clean. Couldn't of been happier with the accommodations. We hope to come back one day!!! Beautiful location, well appointed condo. Perfect for 4 people. Peaceful spot, steps to pool, beach, water. Short drive to Rum Point, enjoyed lunch several times, catamaran trip to stingray island and snorkeling, jet skiing, bio-luminescent kayak tour (must do) and beautiful sunsets. Went over to the other side of the island 3 times (we were here for 9 days) to jet-ski, snorkel, enjoy the beach and have a great dinner at The Wharf. Great trip and a perfect condo to enjoy it from. Thank you for your wonderful review of our island condo. We are so glad that you enjoyed your stay at The Laurelei and we hope you can return again! We had a great time and the condo was perfect. The kelp that was all over the beach in the area made water activities difficult but the condo couldn’t have been better for our family of four. The condo was very clean. It had everything that we could ever want. Laurie and Chuck are very responsive and informative. This is a must stay. Wonderful condo right on the beach. The location was quiet and serene. Condo was nicely furnished and had everything we needed. We’d definitely come back! Set directly on the edge of the Caribbean Sea, The Laurelei is one of 10 condos in the intimate complex of North Pointe, in the upscale community of Cayman Kai & Rum Point. The Laurelei is located on the Caribbean's white sand coast, NOT on an inlet, lagoon, or canal, as are most other Cayman Kai/Rum Point condos. A peaceful, secluded, safe locale, & long empty stretches of white sand beach are yours to explore. The Laurelei is waiting! New in 2007 with up-to-date custom accessories. With 18 ft of sliding glass doors, The Laurelei offers incredible views of the azure Caribbean, and is a mere 20 steps to the water's edge. 1270 sq ft of living space with custom tropical decor, luxurious amenities, free WiFi & local calls and all the comforts of home. The Laurelei's back door opens directly onto a private deck on the sandy beach, with adjacent freshwater wading waterfall & large pools. Great seaside restaurants are just 3-5 minutes away. Nearby is stunning Rum Point Beach Park (2mi), operated by Red Sail Sports, offering Stingray City snorkel trips, hammocks, lounges, hammocks, gift shop, beach restaurant/bar, etc. If you want a real 'island feel', away from cruise ships, & crowds, then the quiet North Side is for you. Grand Cayman's safe easy well-lit road system begs touring. 45 min. from bustling Georgetown, airport & 7 Mile Beach. Golf: Golf available at the prestigious Links at SafeHaven. Starting rate based on 2 - 4 persons. Additional persons $15 per day. Maximum Occupancy: 5 persons. Discount for 2 person occupancy. Occassional Specials. Additional government island tax: 13% 1/2 Rental Total is required upon booking. Balance 60 days prior to trip. PayPal or check accepted via owner who will supply a Rental Agreement. 26 years' travel experience on Grand Cayman. The Laurelei is fully licenced with the Department of Tourism and meets its strict standards. Owner will supply a comprehensive Q&A packet with tips/favorites/info on the island and condo.